I knew I had to make Mexican Corn Cakes the second I saw them. It’s just so weird! Savory pancakes? I’m a big fan of anything full of refried beans, salsa, and cheese. Plus any food that gives me an excuse to eat sour cream is a good thing. I couldn’t wait to taste a pancake with cornmeal and topped with savory goodness. Well, it took me a few bites to get used to it. With Mexican food, I expect something crunchy and you won’t find that in this dish, except from the corn a bit. Every time I eat this, it throws me off with the pancakes. It tastes good, but it takes me a few bites every single time. It also makes me crave real pancakes drenched in butter and syrup! Once it hits me that I’m enjoying a savory dish, I really like it. It’s simple so there’s not much to complain about. Beans, salsa, corn, olives, cheese, sour cream. Basic stuff. The cornmeal pancakes are fantastic. I’m almost convinced, that with an added bit of sugar, you could top these pancakes with syrup. Very fluffy, but not a lot of corn-y-ness. I’d like them to have more of that cornmeal flavor, maybe that would be the crunch I’m looking for. What I like best about this dish is that it’s incredibly filling. At only 270 calories per stack, it’s a calorie counter’s dream. It’s hard for me to finish a stack because I’m so full and I noticed the recipe calls for quite a bit of salsa on top. But pancakes do that to me as well. Although an hour later, I’m looking for a snack. Go figure. I’m normally not a fan of fat-free products, but the optional fat-free sour cream works here. There’s so much other flavor going on, you don’t miss the full fat or reduced fat sour cream. 1. Heat nonstick griddle to 375Â°F or heat skillet over medium heat; spray with cooking spray. In large bowl, stir BisquickÂ® mix, cornmeal, milk, and egg whites until blended. Pour batter by 1/4 cupfuls onto hot griddle. Cook until edges are dry. Turn; cook other sides until golden. 2. In small bowl, mix salsa, corn, and olives. 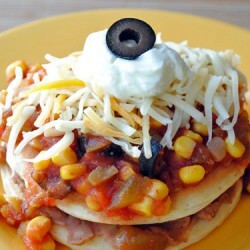 Place 1 corn cake on each of 6 microwavable serving plates; spread each cake with generous 2 tablespoons refried beans. 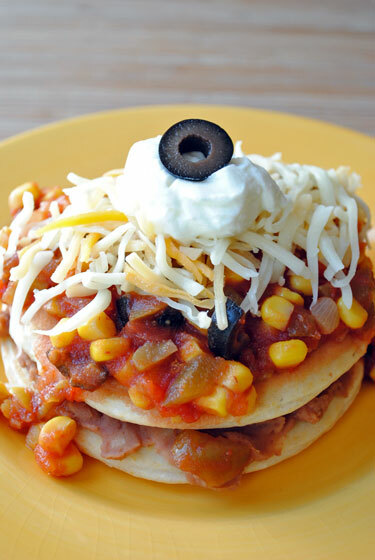 Top each with additional corn cake. Spread 1/3 cup salsa mixture over top of each cake stack. Sprinkle each serving with generous 1 tablespoon cheese. 3. Microwave each serving uncovered on High about 1 minute or until heated through and cheese is melted. * Serve with additional salsa and sour cream if desired. *Note: I found I like heating the stacks without the cheese on top and adding it after. When reduced-fat cheese melts, it globs together into one big mass that makes the stacks difficult to eat.